With sizable malpractice awards and bursts of negative press coverage stemming from patients' surreptitious recordings of medical procedures over the past few years, it may come as a surprise to learn that many clinicians are in favor of having patients record their clinical encounters—provided it's properly managed and legally undertaken. Their reasoning is simple: A recorded encounter helps ensure patients understand complex diagnoses and treatment protocols. In fact, according to Meredith Masel, PhD, MSW, director of The Oliver Center for Patient Safety & Quality Healthcare at the University of Texas Medical Branch (UTMB), any concerns physicians may have tend to be more administrative in nature, such as whether patients' use of recorders would require extra time. "[Physicians] are usually very relaxed and OK with it," she says. Masel oversees a program at UTMB that encourages patients to record all or part of their visits using their own smartphone or recorders or with donated devices that they can take home to review or share the audio file with loved ones. The program started in 2009 in the outpatient oncology service, a decision based on "data in cancer care showing that audio recordings of consultations can be beneficial to families, especially in that first visit when 'you have cancer' is said," she says. Oncology patients embraced the idea, which led Masel to expand the program's reach. Today, "officially, anyone in any area of UTMB can initiate the conversation about audio recording," she says, noting that family medicine, neurology, and internal medicine have begun offering recorders to patients. "My main goal is to spread the knowledge of the opportunity and open this throughout the hospital and all clinics," Masel says. UTMB's program is less about providing recorders than it is about educating patients and physicians on the benefits of recording encounters and how to manage requests to do so. Typically, Masel is contacted by patient service departments and patient support groups to share information on how to make recording visits a comfortable, beneficial process. "In some cases, it may be best for the patient or care partner to record an entire discussion, but in most cases, recording abbreviated reminders of the notes and advice from the visit is plenty," she says, adding that patients often tell her they wish they'd known about the option of recording their visits much sooner. "Another … common thing I see is a bit of hesitation on how to bring the topic up with the clinical staff." UTMB alleviates that concern—and makes the program work for patients and physicians—by instituting clearly defined policies and processes that have been fully vetted by the university's legal team. For example, because Texas is a single-consent state, only the patient or physician—not both—must agree to being audio-recorded. "The rules are just like the rules you see for reporters and audio recording. It goes by state and it's very clear. [Texas] is a one-consent audio state, although we do encourage dual consent, and we do have language for providers about how to decline [a request]," Masel says, adding that, for patients, the important thing is to "explain what the rules are and encourage them to ask their doctors to allow the provider to exercise their own discretion. "To avoid confusion, however, we encourage patients to make their own audio notes with the doctor present and the intention is for there to be a good reminder of the advice for them to bring home." UTMB has created a dummy diagnosis code to indicate when a patient audio-records during a visit. The information is strictly for tracking purposes, Masel says, adding that "no other details are recorded in the medical records. "The biggest challenge is not usually with the doctor or patients but rather the general public saying, 'I don't know if I'd be OK with that' or 'It's got to be a big legal problem,'" she continues. "What if a patient is alone? I reassure critics that if a doctor is OK with having someone's spouse in the room and are practicing what they think is the correct kind of care and are licensed to provide that care, they should feel good that a patient wants to [record it] and listen to it again." Masel notes that technology is moving faster than policy, which could soon become an issue—particularly given the rapidly advancing recording capabilities of technologies such as Amazon's Alexa and Google Home. "There are conversations about getting protections in place [and] I've talked to legal about whether we need a university or systemwide specific policy about what to do if someone has a recorder so they can bring the doctor's advice home. They are pretty firm that we don't have a need for that right now because state-level policies are in place [and] it's mostly a consent issue where doctors can exercise their own discretion," she says, adding that there could be a need for policies describing how to respond to recording requests or for employee training. But for now, "I don't see us owning these data anytime soon and the program is not for research purposes, so nothing is needed at this time." From a purely legal perspective, there are no provisions in HIPAA that forbid recordings by patients. Thus, recording patient encounters falls under the scope of the Electronic Communications Privacy Act, which prohibits recording a conversation unless at least one participant in the conversation agrees to it. Once consent enters the picture, state laws apply. In 39 states and the District of Columbia, only one party needs to consent, while 11 states require all parties to consent. However, consent is just one issue that must be considered, particularly if it is the provider organization creating the file and not the patient. According to Melissa L. Markey, an attorney with Hall, Render, Killian, Heath & Lyman, PC, when the purpose of the recording is to facilitate effective communications about treatment issues, there are "special ethical and physician-patient relationship considerations" in addition to state and federal consent laws that require a focused conversation in advance of pushing the record button. The patient should always consent to the recording, regardless of state law. Furthermore, in "all-party" states, every individual who will be participating in the recorded conversation must consent. Markey recommends that the agreement to be recorded be obtained prior to the recorder being activated, and then repeated verbally while the recorder is running. Additionally, "The discussion should address the ability to pause the recording to discuss particularly sensitive issues, if desired. While patients may be able to surreptitiously record encounters, for a physician to do so would likely be a violation of professional ethics and potentially violate state licensing laws," she says. Confidentiality laws may also apply, as well as data security laws, Markey adds. Therefore, careful consideration must be given to how recordings are stored, secured, and securely destroyed when appropriate. Furthermore, laws related to defamation, reputational harm, and similar claims may apply if the recording is intentionally and wrongfully used to harm an individual. Because the legal issues are murky, Markey recommends that health care organizations establish clear policies governing recording. These should address confidentiality, security, inclusion of the recording in the medical record, access to the recording by the patient, and similar issues. "Because the purpose of the recording is typically to improve physician-patient communications and to permit the patient to share information and refresh his or her memory, patient access is necessary, but the recording must be protected against inadvertent or intentional changes," Markey says. "While these may appear to be operational issues, they relate to the legal concerns of confidentiality, security, and integrity of medical information. Recordings that are created or received by health care providers are subject to HIPAA and more stringent state or federal privacy laws." For example, the patient has every right to allow others to access the recording. However, the provider must ensure that information is maintained in a confidential, accurate, and secure manner—which extends to other patients who may be in close enough proximity to the encounter for their information to be inadvertently recorded. Thus, recordings should be done only in quiet, private locations. Finally, a recording initiated by the provider should be integrated into and maintained in the medical record, whereas a recording by a patient is just a personal record. "Because the recordings include information related to care, such as directions for posthospital care or care alternatives, we recommend that they be included in the medical record," Markey says. "Alternatively, the information contained in the recording could be summarized in the medical record; however, the provider would then lose the benefit of having an exact copy of the recording that was provided to the patient." As a component of the legal health record, any recordings controlled by providers would fall under the purview of information governance and HIM and be subject to release of information laws. Long-term storage and record completion/data integrity issues that impact any archival record would need to be addressed. That's according to Darice Grzybowski, MA, RHIA, FAHIMA, president of H.I.Mentors, who notes that audio or video files present significant challenges for HIM when they are controlled by providers. While they must be included in the medical record, "the logistics and technical concern around including a video or audio recording would be cost-prohibitive for storage, and most repositories of the record or EHRs—other than electronic document management systems, which have the most robust storage capacity—would struggle with incorporating those type of documents into the record," she says. Despite their potential for providing richer detail on the encounter, Grzybowski is skeptical of their real value to the medical record, noting that she would be concerned that clinicians who are subject to recording "probably aren't going to be as forthright as they would without the session being recorded. Recordings have a way of encouraging people to say what they 'think' will be interpreted as most politically correct or, in this case, less likely to cause a risk of legal action." Furthermore, encounter recordings don't add any real value in terms of documentation for coding purposes. First, Grzybowski says, it is not reasonable to expect a coder to listen to or view a recording. Second, "If a transcript were used, it could be used as a type of narrative document to be reviewed, but it is different to pick up codes from a 'conversation' vs a summary document such as an encounter note or discharge summary," she says. For these reasons, Grzybowski is skeptical that recording patient encounters will evolve into a successful trend, at least in the immediate future, particularly given the state of HIT. "When we have an environment that lacks interoperability to the point where one health care provider has difficulty sharing the simplest of documents except by fax or e-mail, the thought of transporting or exchanging recordings is not something that is practical to address at this point," she says. — Elizabeth S. Goar is a freelance writer based in Tampa, Florida. According to Melissa L. Markey, an attorney with Hall, Render, Killian, Heath & Lyman, PC, inviting patients to record information during an encounter can improve care by helping refresh patients' memories of the information shared during the visit. It also serves as an easily accessible source of information that can be shared with family and caregivers to help ensure what was heard is accurate. 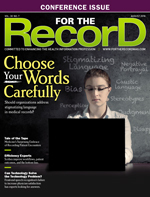 "While some physicians fear that recordings will be used against them in malpractice proceedings, it is more likely that recordings will lead to better communication and better outcomes," Markey says, adding that "policies and procedures can support the use of recording in a way that enhances patient-provider communications and improves care." • Guide caregivers in how to introduce the idea of recording care encounters and how copies of recordings can be made available to patients. • Specify that recordings are not intended to be uploaded to social media or similar websites. • Clarify that treatment recommendations discussed on the recording are tailored to each patient and, as such, should not be used by others unless recommended by a health care provider. • Specify how the recording will be preserved in the medical record. • Request that patients not record the encounter, since an official recording is available. • Specify that the recording may be paused at any time to permit discussion of particularly sensitive subjects. • Specify exactly how the recordings may be used. Finally, Markey recommends posting signage reminding clinicians to request agreement prior to recording or noting that the encounter may be recorded if both patient and provider agree. "Approached thoughtfully, providing the ability to record appropriate portions of patient encounters can facilitate effective patient care. It can improve transparency and support patient engagement," Markey says. "By following ethical precepts and developing best practices, providers can use patient encounter recordings to help patients remain involved in their care and improve provider-patient communication."